As many of you know or if you pay attention you should dayum know by know that I am a freelance/contributing writer for Soultrain.com. 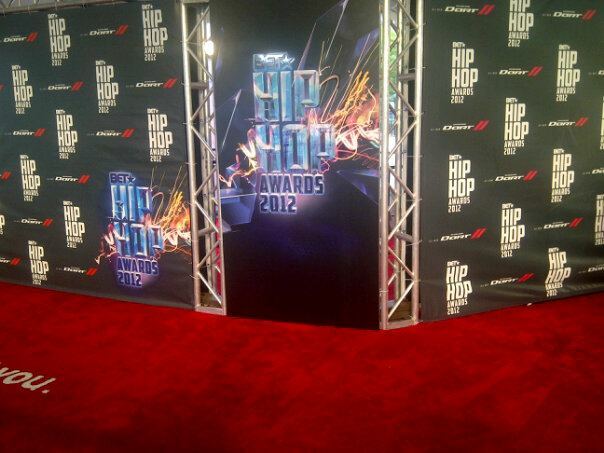 Last weekend, I headed down to ATL to experience the BET Hip Hop Awards 2012 Red Carpet and let's just say, everything is not all glitzy and fantabulous as it looks on television. One would think a red carpet correspondent job would be soooo much fun.. and glamourific..but don't get me wrong, it'd definitely FUN.. but just a little different than what I imagined in my head. On television it all just seems to flow doesn't it.. I suppose just like television news, you never hear the cursing, screaming, hear the tears, smell the sweat etc.. but hey.. if we're able to pull it off without you knowing, then I guess we've done our job. First off the media doesn't just arrive in a chariot driven by Benson or whomever..nope.. we're shuffled like a herd of cattle from BFE but that's okay.. I'm just super glad I keep a pair of flats on hand ..after all you never know when those new shoes you bought and hadn't worn ATALL might start to hurt your feet..in my case.. approximately an hour and a half into the ish LOL. I was fully prepared for things to do to hell in a hand basket because its me..and because BET was involved.. but shockingly.. I have to say.. I cannot complain ..I think they did an awesome job especially for a newbie like me on the carpet.. I had no clue from the position that I was standing in (towards the end of the carpet) just how in the hot hayle I was supposed to see who was coming, who was available for interviews etc.. BET provided a tip sheet THANK YOU JEEEZUS! (cuz if you know me..then you already know I don't know who half of the hip hop artists are today).. the production assistants also gave us a heads up by writing down on a board who was coming up the carpet next and guiding the artists to us.. THANK YOU AGAIN!! Some folks have asked me well who all was there?! My smart arse answer is to say wait til my Soultrain.com post is ready but I'll give you a quick rundown on who I saw.. I have to say that Diggy Simmons is one of the nicest respectable guys everrrrrr and all I could think was.. his parents did an awesome job raising him. T.I. - I got a lil starstruck on this one..cuz I couldn't do ish but stare with a stupid smile on my face like.. THAT'S HIM!!!! Q-Tip.. listen.. that man is fine..and I overheard an interview he was doing..and he is so well spoken and of course he got whisked off into the building before I could grab him to chat..
All in all, despite the alleged shooting and the beef between camps, I had a fabulous time and I realized that it didn't feel like work, and I enjoyed every second of it, and loved how the media folks were so friendly to each other, networking, and nobody stepped on anyone's toes (least on our end of the carpet) and how everyone was just helpful. But reality hits and I'm back on the plantation aka the full time gig and that my friends is a whole other blog that I don't think I need to get into on here LOL..
Great article as usual!! 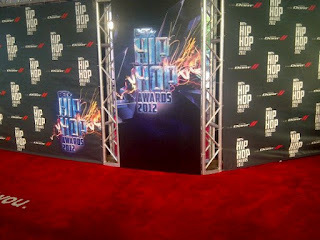 So glad that you got to do interviews on the "Red Carpet"..Who knows, BET might give you a job!! We can only hope..As always looking forward to your next blog..